Rent our space when we're not using it! Philly Improv Theater’s spaces are available for rentals during times we are not using them for our own programming. We have two beautiful stages which are available for daytime events, as well as occasional evening events (when our stage is dark). In addition, PHIT has four rooms which can be booked whenever they are not in use for our own classes or rehearsals. Complete booking information for our spaces, as well as instant booking, is available via the Philly Space Finder website. Click here to be taken directly to a list of PHIT’s spaces available for rentals. 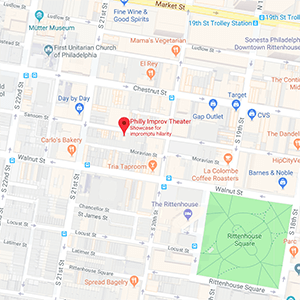 Philly Improv Theater’s Mainstage is on the ground floor of the Adrienne Theatre – and was formerly the home of InterAct Theatre Company and The Wilma Theatre Project. The beautiful 107 seat Mainstage features stadium seating, with a large 34 ft. wide and 25 ft. deep stage which can be closed off with a manually operated black velvet curtain for a more intimate atmosphere. Two staircases – one of each side of the stage behind the curtain – lead to a nice greenroom with 3 separate dressing rooms and two restrooms. For performances or events he stage has a standard light-plot, full audio and video projection capabilities, and includes a tech operator for all equipment in the rental cost. Rehearsals do not include use of the theatrical lighting, audio, video projection, or the presence of a tech operator (with substantial savings as a result). Philly Improv Theater’s Second Stage is on the second floor of the Adrienne Theatre. The beautiful 60 seat Second Stage features stadium seating, with a large 24 ft. wide and 16 ft. deep stage which can be closed off with a manually operated black velvet curtain for a more intimate atmosphere. Two entrances – one of each side of the stage behind the curtain – lead to a spacious greenroom with a separate private restroom. An approximately 440 sq. ft. room located on the second floor of the Adrienne Theater arts complex, next to Philly Improv Theater’s offices. This space has seating for 20-40 people, available tables, heating and air-conditioning, and is accessible for wheelchair users with a ramp in the room. An approximately 400 sq. ft. rehearsal room located in the finished basement of the Adrienne Theater arts complex. This space has seating for 18 people, available tables, and heating/air-conditioning. An approximately 300 sq. ft. rehearsal room located in the finished basement of the Adrienne Theater arts complex. This space has seating for 16 people, available tables, and heating/air-conditioning. An approximately 200 sq. ft. rehearsal room located in the finished basement of the Adrienne Theater arts complex. This space has seating for 16 people, available tables, a whiteboard, heating/air-conditioning, and a computer and wall-mounted television monitor (available by request).